Mr Brown has 308 nominations, prompting his only rival, left-winger John McDonnell, to concede. He was 16 nominations short of the 45 required. 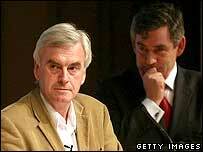 Mr Brown should now take over unopposed after Tony Blair steps down on 27 June. Nominations officially close on Thursday, but there are not enough remaining MPs to allow Mr McDonnell to run. He said: "With Gordon Brown having gained 308 nominations from Labour MPs, it is now mathematically impossible for me to reach the nominations I require to stand. There will not now be an election." He congratulated Mr Brown, but said it was a shame party members would be denied "an opportunity of participating in a democratic election for the leader of this party". "I had hoped by standing I would have given them a voice in this crucial decision." Mr Brown's campaign said they would await the formal voting figures announced by the party on Thursday before making any statement. But his campaign manager, Commons Leader Jack Straw, said that they were "delighted" the party was "uniting" behind the chancellor. Labour MP for Cannock Chase, Dr Tony Wright, earlier told the BBC he had nominated Mr Brown as leader, but it had not yet been added to the Labour Party website. This gives the chancellor more than the 308 nominations needed to avoid a contest. Labour MP Andrew Mackinlay's office has reportedly said he would be nominating Mr Brown, although this has yet to be confirmed by the BBC. A Labour spokesman said the party would not be commenting further on the nominations until they closed at 1230 BST on Thursday. Of the other MPs yet to declare, the speaker cannot nominate and the deputy speaker, Sylvia Heal, has told the BBC she will not nominate anyone. That leaves 15, including former home secretary Charles Clarke and former welfare reform minister and long-standing opponent of Mr Brown, Frank Field. Candidates who get 45 or more nominations go to a ballot of party members, trade unionists and Labour MPs and European Parliament members. In the deputy leadership contest, in which there are six candidates, only International Development Secretary Hilary Benn - with 42 officially listed nominations - has yet to get through to the national ballot. But a source close to Mr Benn told the BBC on Wednesday that he now had the required 45 backers. Backbencher Jon Cruddas, Education Secretary Alan Johnson, Justice Minister Harriet Harman, Northern Ireland Secretary Peter Hain and Labour chairman Hazel Blears have all got through. Those candidates who make it on to either ballot paper will take part in 10 hustings around the country ahead of a special conference in Manchester on 24 June, when the new leader and deputy leader will be named. But even as the sole leadership candidate, Mr Brown will still take part in hustings. On Wednesday he was at a campaign event in Manchester, outlining his ideas for an "environmental corps" for young people to combat climate change and saying he wanted the World Bank to be "a bank for the environment". Mr Blair and deputy Labour leader John Prescott will hand over on 27 June.